Comics Experience Blog: CE alum and artist DaFu Yu exhibits at MOCA; appears in Anthology! CE alum and artist DaFu Yu exhibits at MOCA; appears in Anthology! CE Alum and artist DaFu Yu recently drew a story in the Secret Identites, Volume 2: Shattered anthology. Secret Identities is an Asian American superhero comic anthology done by asian creators, including fellow CE alum and writer Amy Chu. In addition to DaFu and Amy, the anthology includes the work of: Alice Meichi Li, Eric Kim, GB Tran, Jeremy Arambulo, Jerry Ma, Johann Choi, Kripa Joshi, Louie Chin, Robin Ha, Saumin Patel, Jamie Noguchi, Ming Doyle, Jef Castro, Tak Toyoshima, and Glenn Urieta. The Museum of Chinese in America (MOCA) will also be exhibiting some of DaFu's artwork as part of the Alt.Comics: Asian American Artists Reinvent the Comic Book exhibition, on view from September 27, 2012 through February 24, 2013, featuring art from the anthology. Alt.Comics showcases the efforts of Asian American artists to establish a new and authentic identity by subverting stereotypes and juxtaposing disparate images. The exhibition focuses on alternative and independent comic spaces, particularly in the hubs of San Francisco and New York, which produced many of the most prominent artists in the independent scene. The exhibition features work by DaFu as well as Gene Luen Yang, Derek Kirk Kim, Thien Pham, Lark Pien, Jason Shiga, GB Tran, Jerry Ma, Larry Hama, Alex Joon Kim, and Christine Norrie. 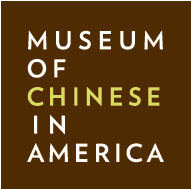 MOCA is a nonprofit educational and cultural institution that presents the living history, heritage, culture and diverse experiences of Chinese Americans through exhibitions, educational services and public programs. Congratulations, DaFu, on the anthology and the exhibit!